Do you relish the joys of hot toast spread with your own homemade butter and jam? Love to dazzle your friends with jars and tins of choice goodies–all created by you? The kitchen is a paradise for crafty cooks, and whether you’re a newcomer to the realm of amateur artisanal edibles or a seasoned food crafter on the prowl for your next batch of appetizing challenges, Jam It, Pickle It, Cure It has the recipes for you. Projects range from perfect pantry staples (Butter, Crackers, Pasta) to festive giftables (Toasted Walnut Brandy, Lemon Curd, Peanut Butter Cups); some give quick gratification (Mayonnaise, Rumkirschen, Potato Chips), while others reward patience (Gravlax, Ricotta Salata, Kimchee). Practical prep-ahead and storage instructions accompany each recipe and several give variations (like Caramelized Onion and Thyme Butter–yum). 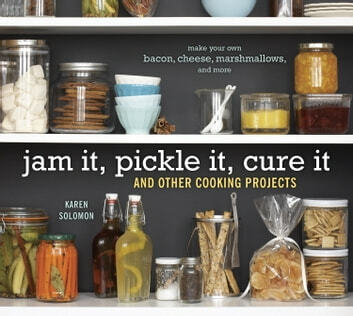 Complete with color photographs and the accumulated wisdom of author Karen Solomon’s years of food crafting, Jam It, Pickle It, Cure It is chock-full of ideas on how to use it, serve it, and give it away.